Environmentalists, however, say that the long-term impacts of the flooding cannot yet be determined. They also point out how the dangers of placing oil and gas rigs in flood-plain areas are a recipe for disaster. Amy Mall, policy analyst for the Natural Resources Defense Council, noted the sheer luck that most of the flooding occurred in areas where active fracking operations were not actually happening; most of these wells were already in production. 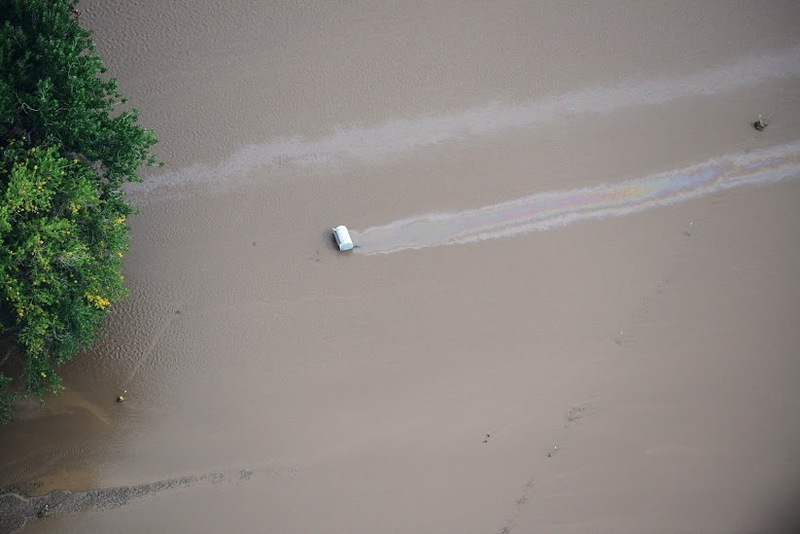 About 1,900 wells were “shut in” in preparation for the predicted flooding, but storage tanks and other production-related equipment experienced the impacts of the flood waters. FracTracker Alliance created the following map of United States Geological Survey (USGS) streamflow gage stations across the Lower 48, in areas of mapped shale plays. Each of the USGS points is interactive. Pop-up bubbles allow the user to link directly to the USGS websites for that particular stream gage. Note that not all of the stream gages are currently active; some show only historic USGS data. Many sites, however, show a wealth of real-time information on stream discharge and allow the user to customize time parameters. USGS also includes stream gage height and contributing drainage area. Zooming into an area, users will also see wetlands delineated as part of the National Wetlands Inventory. These wetlands may also be endangered by floods that pick up waste material from oil and gas extraction sites. Click here to view the full-screen version of this map. To view gas wells in a particular state, visit FracTracker’s state-by-state map gallery.